For use in DOT 3 and DOT 4 brake systems. 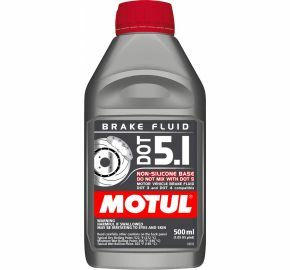 Non-silicone based, long life and 100% synthetic, DOT 5.1 BRAKE FLUID conforms to the highest standards in brake fluid performance. DOT 5.1 is specially designed for Anti-Locking Brake Systems (ABS). With a high dry boiling point of 270°C (522°F) and a high wet boiling point of 185°C (365°F), DOT 5.1 delivers the best brake performance and mixes with DOT 3 and DOT 4. For use in DOT 3 and DOT 4 brake systems.100% synthetic, RBF 600 FACTORY LINE is a polyglycol-based brake fluid exclusively designed for races. Developed to resist high temperatures and wet-weather conditions, RBF 600 has a high dry boiling point of 312°C (594°F) and a wet boiling point of 216°C (421°F). This ensures effective braking under extreme racing or rainy conditions. 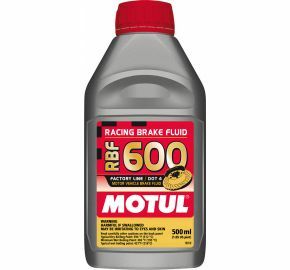 Couple this with its outstanding anti-vapor lock performance, RBF 600 has become a well-trusted brake fluid in many races. RBF 600 mixes with DOT 3 and DOT brake fluids. Filled in a Nitrogen gas environment and therefore eliminating contamination from absorption of moisture during storage. Brake fluids are hygroscopic and they will absorb water from air.